Pomelo fruit and the Middle East arak are making one of the year’s hottest and refreshing new cocktails. Here’s the recipe. Baffled Once: Purchased as wacky Christmas gifts, the four bottles of arak inside our New York-bound suitcases were packed more carefully than human transplant organs are, but their bottle caps were as leaky as Julian Assange. To bypass anise-soaked clothing, I sealed each cap with candle wax and swaddled the bottles with soft t-shirts. Popular throughout the Mediterranean, this potent spirit originates from Iraq. Similar to French pastis, Italian anisette, Spanish ojén, Turkish raki and Greek ouzo; arak is a clear, colorless apéritif that contains as much as 63% alcohol. Recipes vary. Iraqis may ferment date juice, Levantine folks use grapes. But the brew can also be culled from potatoes, figs or grains. There’s an Iranian version called “dog’s sweat” (Aragh-e Sagi) that skips anise flavoring altogether. Arak is cheap and easily available, but hardly as drinkable as, say, Jordan’s ubiquitous Amstel beer. After the initial novelty, would my friends actually drink it? Baffled Twice: The backbone of my weekly knitting group is communal dinner: a “loaves and fishes” deal where everyone contributes. Last week, someone plunked an enormous and spongy yellow ball on the table and pronounced it “dessert”. It was a pomelo. 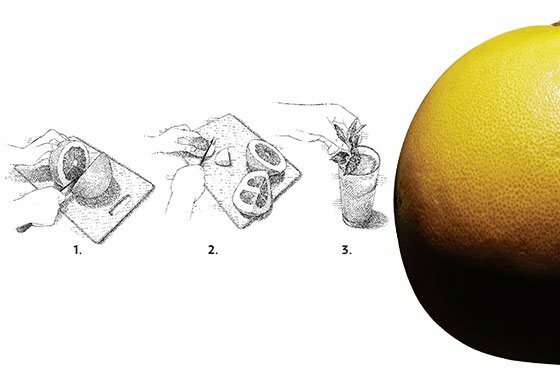 Grown commercially in Southeast Asia (ours came from Israel), this citrus orb has a thick, pulpy skin that’s a challenge to neatly peel. Drippy and awkward to handle, the fruit was delicious, a gentler version of grapefruit – less tang, more sweetness. But that “idiot-abroad” thought bubble popped over my head again: what do you DO with this fruit? Right now in Manhattan’s East Village, a pop-up restaurant called The Kubbeh Project is happening (until March 21), turning Zucker Bakery into an after-hours Iraqi-Jewish café. The project promotes kubbeh, a dumpling soup attributed to Iraqi Jews that is so energy-intensive to cook that it’s on the culinary list of endangered recipes. New York Magazine suggests you wash down your kubbeh with a drink with similar origins: an arak and pomelo cocktail that’s new to Manhattan but allegedly popular in Israeli bars. The recipe gives new life purpose to two mysterious ingredients (I’ve doubled the quantities to make two servings – you never ought to drink alone). Cut the pomelos in half and next into segments. Trim away the pith, and pop the fruit in a juicer. Combine the arak and pomelo juice over ice in a highball glass. Garnish with mint. Makes two drinks.